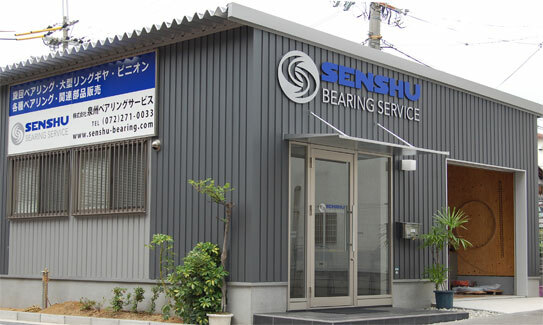 Profile | Company | Slewing Bearing｜SENSHU BEARING SERVICE Corp.
Feb,2009　Establishment of SENSHU BEARING SERVICE Corp.
Go past Sakai turnoff, go straight on Hanshin Expressway Sakai line. Turn left at Funao-cho-Higashi 2 on route 26. Turn right at Kamiishiichino-cho, go 3 km toward the south. Go left at the intersection of Kami for Kusabe and go straight 1.5 km until at bus stop of Yamada-Kita. Go down at Ayazono for Sakai Senboku Toll Road from the junction of Sukematsu on Hanshin Expressway, and go straight 3km. Turn left at the intersection of Tsuruta Pond, go straight 200m. Go for Sakai Senboku Toll Road from the junction of Hanwa Expressway. Go down at Hishiki Interchange, turn right at the intersection of Tsuruta Pond, go straight 200m. Go down at Sakai Interchange of Hanwa Expressway and turn right, turn left at the intersection of Hirai-Ohashi, go 2 km toward the west. Turn right at the intersection of Tsuruta Pond, go straight 200m.